The house that Jeter is building, and the aftermath of a victory parade. 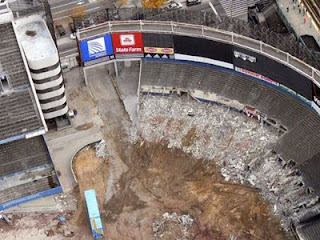 The old Yankee Stadium was called "The House that Ruth Built". Will the new one be called "The House that Jeter Built"? Derek Jeter has been the preeminent Yankee player for the past decade, just as the Babe was in his day. Time will tell, and A-Rod may offer a dissenting opinion. When I was in Tampa recently, a friend said, "You've got to see the house Jeter is building on Davis Islands." It was pretty easy to spot from Bayshore Boulevard: a massive edifice under construction on the western waterfront of the larger of the two islands. I drove out there and got the shot above. I've been told it's to have twenty three rooms, and is even larger than George Steinbrenner's house, which is located a few miles to the north. 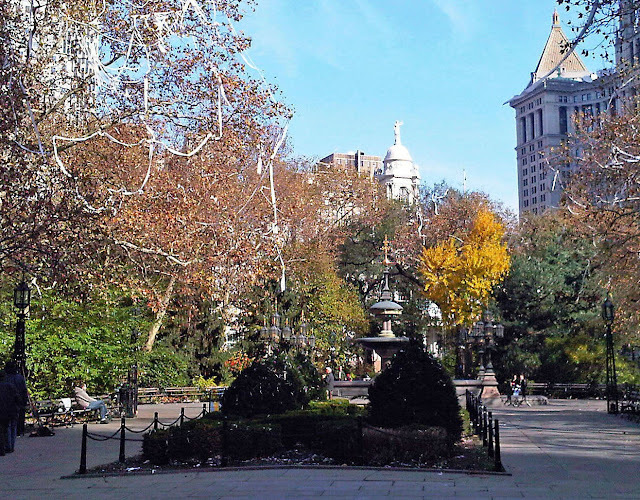 The day after the Yankees' victory parade on lower Broadway, trees in City Hall Park were still festooned with paper.